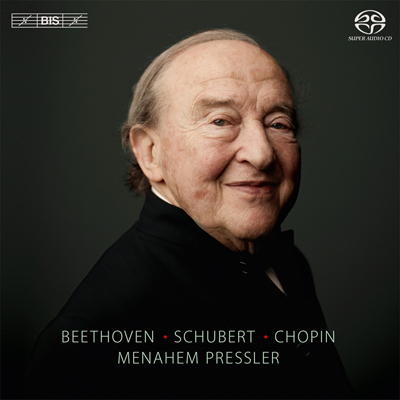 Turning 90 in December 2013, Menahem Pressler was the pianist of the legendary Beaux Arts Trio for almost 55 years, and continues to enjoy a blossoming career as soloist and recitalist, while remaining as committed to teaching as ever. In another context he has discussed the piece in the context of Schubert’s final work for the piano, the Sonata in B flat major: ‘Beethoven’s Sonata Op. 110 illustrates idealism in the first movement, hedonism in the second and regret and pain in the last movement from which two fugues emerge triumphantly, as if saying, “Yes, life is worth living” – and this is what I feel. As an epilogue to these two pillars of the piano literature, Menahem Pressler has chosen to play a particular favourite of his, a work that he often performs at the end of his recitals: Chopin’s brief but exquisite Nocturne in C sharp minor, Op. posth., composed in 1830 – only two years after Schubert’s Sonata – with a dedication to the composer’s sister.